I almost always take context into consideration when deciding what to wear. When the landscape was covered with snow, I felt it important to wear outfits that contrasted with the white background. Now that the snow has melted, I'm back to having a bit more freedom to dress according to my surroundings. The flecks of color in this vintage cardigan brought to mind Van Gogh's infamous brushstrokes, so I decided to emulate some of his landscape paintings in the colors of my outfit and my choice of location. It always strikes me how the sun in Van Gogh's paintings really looks like it's on fire, exactly how it appears in the last few moments before it sets, which is when these outfit photos were taken. 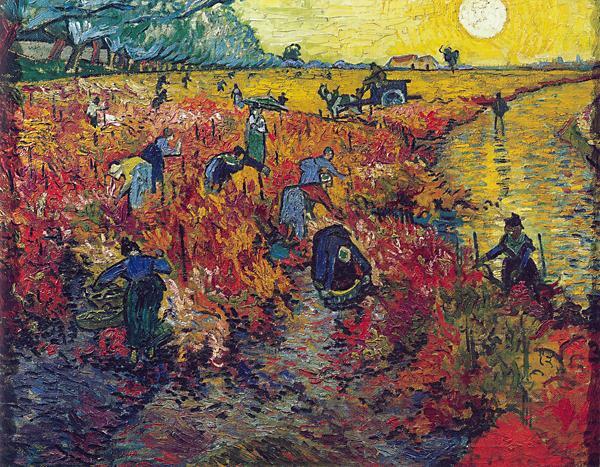 Van Gogh was a brilliant colorist, and I adore the way he used contrasting colors to establish space in these paintings. For example, in the work below, the highly saturated yellow versus the pastel purplish-blue give the illusion of an entire field of depth. 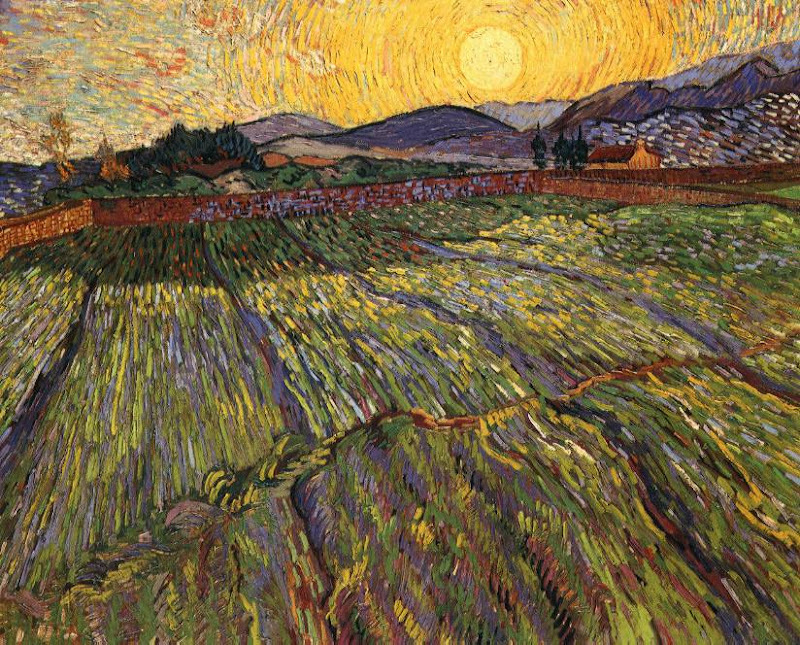 Although Van Gogh's life and work has been highly romanticized due to his untimely death, there is no denying that he incorporated a sense of beauty into his works that is unparalleled by scores of other Expressionist paintings. 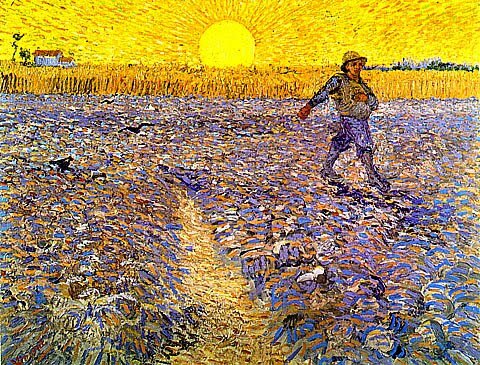 My very favorite aspects of Van Gogh's works are the brushstrokes. As I said before, hundreds of thousands of these make up each work, and, insignificant though they may be in isolation, together they create the masterpiece of a Van Gogh painting. I can file this quote under my New Year's resolution to live my life like an action painting, making each stroke an important part of the whole. To keep with the Van Gogh theme, I wore cool colors against the fire-like reflection of the setting sun, with the addition of fuchsia, which was particularly reminiscent of Red Vineyards (the first painting in this post). My entire outfit is vintage (metallic mohair cardigan, silk blouse, belt and belt buckle, hammered leather purse, and Levi's bell bottoms) except for the suede Zigi SoHo booties. Also, thank you to Mode. who nominated me for the Stylish Blogger Award! Don't forget to follow Artfully Awear on Tumblr if you're interested. Beautiful, Ariel, nice juxtapositions. I don't recall seeing the first Van Gogh print in your series - they're all beautiful, and I like that you emphasize the huge number of brushstrokes that went into the paintings. Lovely ensemble, especially the sweater, the blouse and the belt which echo the colors in the paintings. Great set of photos with the different light. Congratulations on your blog award nomination, glad you're getting recognition and I hope you win. wow, amazing colours, great photography!! congrats on the blog nomination!!! this outfit is very well put together ! its not easy pulling off bell bottom jeans ! The purple cardigan and the belt are beautiful. I'm in love. great outfit babe. thanks so much for your comment! now i will sleep happy :) is your hair naturally wavy because it is gorgeous. i wish i had natural waves! Great pictures! You look so pretty! I love your unique, quirky style! I also wish I had your hair. Love the belt, love the setting, love the art pics! 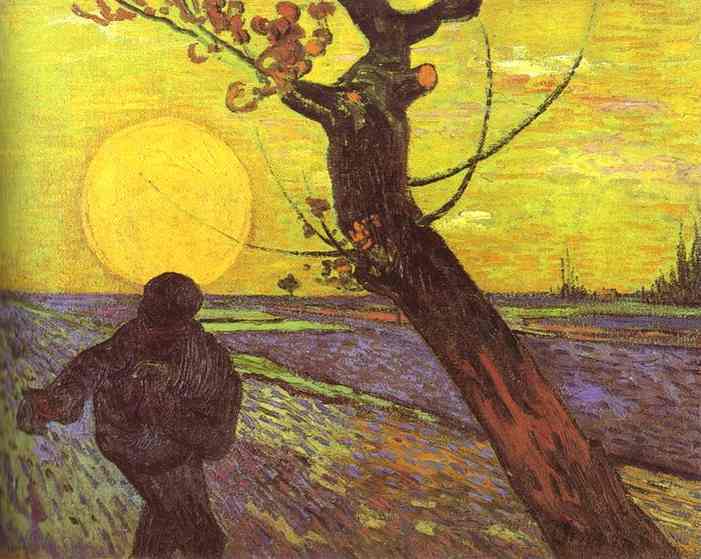 The yellow is so vibrant and I can see what you mean with Van Gogh's illustrations of the sun. Never really picked that out before. Gorgeous and creative post, darling! Your hairrrrrrrr - It's beautiful! Another great outfit!! That cardigan & that purse are both so super cute. I love this outfit especially the shoes. You have an amazing hair style! I love these pictures, great outfit! I've just spent all weekend looking up vintage tooled leather purses in just that style! Where did you find that one? I love wearing bright colors and seeing outfits like these in the middle of winter...reminds me of warmer times! I love Van Gogh's paintings, and I think your outfit and backdrop are perfect! Bright vibrant colors are so wonderful to wear in the winter. I love all the colors you're wearing! Your cardigan is gorgeous! I love how the colors weave in and out of each other, and the shape of the shoulders is lovely! Gorgeous colours.. You have a great fashion style.. I am absolutely loving this post. I love how you have brought all the different colors together, because that's always something that i have trouble doing. Beautiful pictures! I'm in love with your cardigan/jacket!! The colors are gorgeous!!!! I love Van Gogh his work is so beautiful and the textures of the brush strokes are amazing!!! Following I would love it if you'd follow me back!! This outfit is so stunning! So many colors and it doesn't look icky/ tacky at all. Love the pics too! I love the texture of that sweater with the satiny shine of the blouse, and the color pairings are perfection. Go, van Gogh!